I’m often fascinated by even the simplest hundred-year-old advertisements. 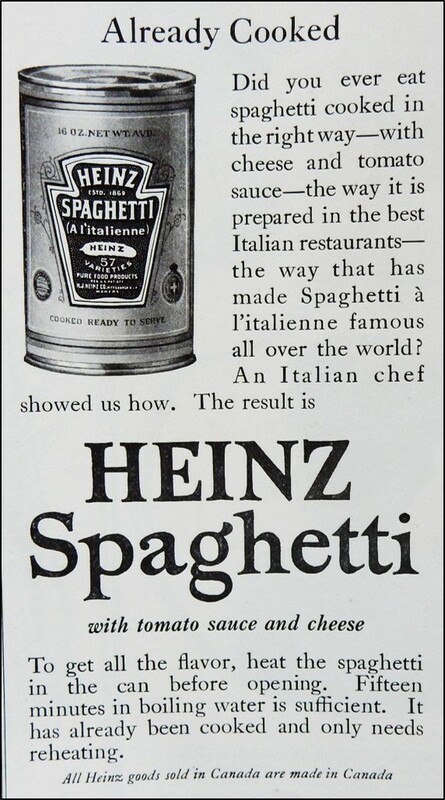 For example, this advertisement for Heinz Spaghetti is so basic –yet it provides many insights into the use of commercially prepared foods, ‘international cuisine’, and cooking methods back then. That’s really interesting — the instruction to heat it in the can. I’ve had the occasion to eat cold spaghetti out of the can, and believe me: heating it would be a great improvement. But in 1916, I can only imagine how many women sighed with pleasure at the thought of an easily-made lunch. A friend and I were talking about another golden oldie: Mary Kitchen hash. We used to buy it, then slice and fry it. Like the spaghetti, it’s still in the stores, so it must have its fans. Actually, I remember it as being rather good. I ought to buy a can and test my memory! In 1916, they probably considered canned spaghetti to be a “modern” food. I’ve never tried Mary Kitchen Hash. It’s amazing how long some of these products have been available. To heat a can before opening for full flavor…. Never tried that before. Interesting read. The directions to heat in the can before opening seem odd to me. It must have worked, but I’d worry that there might be a risk that the can could explode. Never heard of heating the can before opening. I wonder if it made it taste better? Too bad we can’t try it. Maybe they were worried that if the spaghetti was put into a saucepan to heat that it might burn onto the bottom of the pan. Many people used wood or coal stoves back then, and they had less control over the temperature. I didn’t realize you could buy canned spaghetti 100 years ago! Commercially canned foods have been around since the 1800’s. I understand and sometimes use prepared tomato sauce, but will never understand the idea of precooked/canned spaghetti in sauce. It’s one of the worse things anyone can put in a can, yet it’s quite popular somehow. It didn’t occur to me it started so long ago. Very interesting. It seems like many people consider convenience to be more important than taste. Canned foods have been around a long time. For example, Upton Sinclair wrote about the poor conditions in a plant where meat was canned in The Jungle. It was published in 1906. We never had spaghetti from a can when I was young, but we did eat canned ravioli. I enjoyed what you wrote and the responses. I’m very surprised at how long canned spaghetti has been around and also the instructions for heating the can first. I remember eating canned baked beans and spaghetti often as a child. i think it was quite common in Australia. Canned convenience foods were very popular when I was growing up. If seems odd now, but in some ways I think that we thought that they were somehow better than homemade foods. Be careful heating a closed can. It can explode from steam building up in it. You need to put vent holes in the top. It can be real exciting when one of those cans go off. I learned this in the Army eating C rations that Army no longer use. I wonder how many cans of spaghetti ended up on the ceiling. What were they thinking … ‘as prepared in the best Italian restaurants…’? The Advertising Standards Authority might have something to say about that in 2016 – I hope! I’m glad you liked it. I also thought that it was an interesting ad. Isn’t it interesting how naive we were about Italian food? Now it’s so much a part of everyday life . . .
Ah the bad old days of Italian food – I have a memory of trying this as a child – awful, mushy stuff. Great as though! Great AD is what I meant! I had to read this a few times to make sure I was understanding that the spaghetti was in the can. “Only” 15 minutes to heat? I doubt it came out al dente! And here I thought that my childhood Spaghettios were the first to come out of a can. It is hard to believe that spaghetti was an exotic foreign food. I was also wondering if the cans exploded. Apparently it didn’t take much back then for a food to be considered exotic. Even though the ad says to heat the spaghetti in the can, it doesn’t sound safe to me. I wonder if any creative cooks just emptied the contents into the pot to heat. Great ad. So interesting! Yes, as another reader mentioned, I also used to eat Spaghettios out the can. Cold! Gosh, I’d forgotten spaghetti in a can. And I would definitely not do that heating in a can thing, given that the can is lined with preservative toxins — at least that’s what I learned at a nutrition seminar a couple of years ago. Yuck – I hadn’t though about that. It definitely does not sound safe to heat food in a can. It’s strange how the ad recommended it. haha! Don’t tell anyone, but I did too Sheryl 🙂 At the neighbors house, of course! Wow! This ad probably sounded very exotic “back in the day.” Imagine heating something up while still in the can! I am always learning something new from your blog! I had no idea canned pasta was available 100 years ago. I associate canned spaghetti and “Beefaroni” with my childhood, but clearly it was available a few decades before that! By I do know my mother always heated it in a saucepan, not the can. I wonder when that changed? Maybe after a few cans exploded? Somehow it doesn’t seem like a good idea to me to heat the spaghetti in the can. It is so funny. I love the charm. It reminds me how times change. I’m glad you liked it. I wonder what people a hundred years from now will think about our modern convenience foods. Me too! Hard to know. Can’t but smile at the heat before opening as an uncle of mine did same in the oven with a steak and kidney pie and the memory still lingers of the mess and laughter! Not opening tins remains a bit of a phobia of mine!!! LOL – What a fun memory! I don’t think I ever ate canned spaghetti cold, but when I was teaching at SCSU I’d eat cold Campbell’s soup out of the can — a quick lunch, usually in the office accompanied by another woman on the faculty. The men had time to go to the cafeteria. We women had to fill every hour because we had family and households waiting for our care at home. Whew, it sounds like you were juggling a lot of things. It’s so difficult how the years when the tenure-review process generally take place occur at about the same time that family responsibilities are often the greatest. The joy was that every segment of my life fed the energy for every other part — including the colleague who ate lunch in the office with me. What I wouldn’t give to have that energy now! But then, life has its seasons. How true – During times that were busy and challenging I’ve often learned much from others and made new enduring friends. I’m in awe of how your energy is gradually returning. I’m totally convinced that there are wonderful things we can both learn and contribute during each season of our lives. How true! For both you and me. I LOVE your site!! So many fascinating posts to read through. I’m so glad to find you through the A to Z blog. Welcome! I have a lot of fun doing this blog and it’s wonderful to hear that you enjoy it.